Nearly a week since Cyclone Idai struck three of the most vulnerable countries in Southern Africa, needs are rising and humanitarians still don't have a full picture of the extent of the disaster. Aid access is one of the biggest challenges and cholera is a major concern. More than a million people in Malawi, Mozambique, and Zimbabwe have been affected by what the UN called a "massive disaster". Its emergency aid coordination body, OCHA, said "the situation is likely to deteriorate, and the number of people affected is likely to increase". Mozambique was the first country hit. Some reports estimate 90 percent of Beira, the fourth largest city, with more than 500,000 residents, may be damaged or destroyed. But Médecins Sans Frontières said "it's still too early" to have a complete overview of the situation as many areas remain cut off and inaccessible by road. Rain and heavy winds continue, so reaching certain areas by air or sea is a challenge. The storm also destroyed most of Beira's telecoms infrastructure, making it difficult to get word out of the affected areas. "I am able to say that all health centres and hospitals have been affected," said Caroline Rose, MSF's head of mission in Mozambique, expressing concern about the growing health needs, especially the risk of waterborne diseases, including cholera. "Several health centres have lost their roofs and are in very, very bad condition." In neighbouring Zimbabwe, "the situation we are seeing now isn't fully clear," agreed Mildred Makore, Mercy Corps director of programmes in the country. "Chimanimani, which is the worst-hit district, is still inaccessible. Evaluations are going on… and we may be overwhelmed when we have true access." Here's a round-up of what we know about the humanitarian needs and response. The scale of damage in Mozambique is "massive and horrifying", the International Federation of Red Cross and Red Crescent Societies said. Tens of thousands lost their homes; roads, bridges, and crops were washed away; and people remain trapped on roofs awaiting rescue as parts of Beira are still under water. More than 100,000 people needed emergency evacuation in Beira and surrounding areas in Buzi District. Although the official death toll is just over 200, Mozambique's president estimated more than 1,000 people may have been killed. So far, 1,500 are injured and 17,000 displaced. 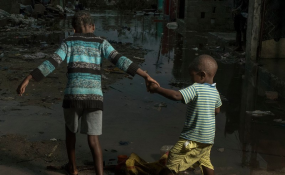 MSF described the scene as "destruction - and a lot of water", saying that electricity, telecommunication lines, and main roads leading into Beira remain cut off, with houses and buildings submerged, and hospitals severely damaged. Search and rescue operations are continuing, but many people remain unreachable. Those who made it out of affected areas are living informally in schools, churches, or sometimes just out in the open, where they face the risk of respiratory infections and other diseases. With people exposed to the elements "all the small problems will become big problems", MSF's Rose said. In Nsanje, one of Malawi's worst-hit districts, "houses fell down completely or partially, and a lot of toilets and kitchens went down," said Ilse Casteels, MSF's head of mission in the country. "Because of the floods people moved to higher areas, regrouping in churches and centres and schools. For the moment there are a lot of families staying there," she said, even though some people have returned home to start rebuilding as the flood waters recede. In Malawi and Zimbabwe, people lost their homes but also their livelihoods when the floods destroyed their crops. Many of those affected in Zimbabwe's eastern highlands are small-scale farmers, Mercy Corps' Makore said. As a result worsening food security will be a major concern in the months ahead. An estimated "200,000 are in need of urgent food assistance for the next three months in Zimbabwe," the WFP said, with Chimanimani the hardest hit. In Zimbabwe's Chimanimani district, where severe flooding wiped out roads and bridges and left the area accessible only by helicopter, the International Rescue Committee has set up a mobile clinic and is distributing food and specialised kits for women. Mercy Corps has been focusing on water, hygiene, and sanitation services. In Mozambique, the Indian Navy and the South African Air Force have been assisting the government's search and rescue operation. Meanwhile, aid organisations are estimating a long road to recovery. The World Health Organization is sending three months' of supplies for 10,000 people. CARE is working with the government of Mozambique to provide seeds and livestock to replenish farms that have been decimated by flooding. The UN's Central Emergency Response Fund, known as CERF, has allocated $20 million to ramp up the humanitarian response across the three countries. The UK is donating almost $24 million, the EU close to $4 million, and the African Union $350,000. Tanzania said it was sending urgent relief supplies, including tonnes of medicine and food. "In Beira, we fear a huge cholera outbreak soon," said MSF's Rose. "The main challenges will be [getting treatment] for people who don't understand they have cholera, and that it's urgent, or people who are not reachable, or people who cannot reach health centres." Given that areas are still cut off, this is a real concern. To mitigate the challenges, MSF will attempt a "decentralised system with small cholera centres in many zones," Rose said. "We cannot ask people to go to big centres. We will have to be in the communities where they are." "Our major concern is that the water bodies have been contaminated, because the latrines have been destroyed," Makore said. "We are concerned because there can be an ensuing disaster following that, related to the waterborne diseases," including cholera and typhoid, as well as malaria. "We have to make sure the affected population has access to clean water," she said, adding that a lot more support is required to help those affected in Zimbabwe - from immediate lifesaving aid to longer-term support for communities who will need to rebuild. In Malawi, MSF's Casteels said the most urgent need is clean, potable water, after many boreholes were affected by the flooding. She also expressed concern about cholera and malaria spreading in the coming weeks. "The biggest concern that you hear is about food. Access to food now, but also in the future. People are really afraid crops are affected. And because the country is so dependent on agriculture, that's a big concern." Mercy Corps' Makore said the priority should be resiliencebuilding for affected communities. "Contextually, for Zimbabwe right now, we have got two natural disasters at the same time. The El Niño-induced drought and now this [flooding]... Whatever produce was available was washed away, and livestock was also washed away," she said. "Right now, we need to speak about food security, which was already an issue, but now we need to think beyond that because of the potential for disease outbreaks, shelter concerns, displacement. So I think we have a huge task ahead of us as organisations." In Malawi, Casteels raised similar concerns. "The biggest concern that you hear is about food," she said. "Access to food now, but also in the future. People are really afraid crops are affected. And because the country is so dependent on agriculture, that's a big concern." Based on the aftermath of previous disasters that have affected Mozambique, MSF's Rose said: "it will take years to rebuild the town [of Beira]". "This will have the worst impact on those most vulnerable," she said. "It's those who have small, fragile houses that are worst impacted, as they are always the people without the means to build a new house. So it's a vicious cycle. Those who have no means to rebuild will be left outside with no house, more at risk of disease and worse off." "The situation is already complicated and it will continue to be, especially for the most vulnerable," she said. In Zimbabwe, already confronted by a host of humanitarian, economic, and political challenges, Cyclone Idai has only made the outlook more bleak. "The priority is to help get people back on track and restore some level of dignity and hope," said Makore. The link between extreme weather events and climate change can no longer be disputed. Climate change, being a culmination of unrelenting emission of greenhouse gases, mainly by the industrialized rich countries, is responsible for the disaster unfolding in Zimbabwe, Mozambique and Malawi - countries with among the world's lowest emissions rates. The Centre for Natural Resource Governance is of the view that the rich countries must pay their climate debt to the Zimbabwean people - but the Zanu PF government and Minister Mthuli Ncube cannot be trusted to manage the payments. The greatest impact of the storm was experienced on landfall. It caused flooding, excessive wind-speed and storm surge damage in the central region of Mozambique. Adjacent countries of Malawi and Zimbabwe experienced severe rainfall, flooding and damage from the high wind speed. Madagascar also experienced bouts of high rainfall during the storm's pathway to Beira. The storms off Africa's east coast are weaker than their northern hemisphere counterparts. Category 4 and 5 tropical cyclones make landfall at a near-annual rate in the North Atlantic and North Pacific. Tropical cyclones are large storm systems. Immediately surrounding the eye of the storm - a region of calm weather, no wind and no rain - are spirals of storm clouds that span a minimum radius of ~100km. These cloud bands represent the thunder storm conditions, with the rain and winds typical of a tropical cyclone. In recent years concerns have been growing about the impact of climate change on cyclones. Research has shown that changes to the world's temperature, as well as ocean warming, are responsible for an increase in the severity of tropical cyclones. This has recently been researched for the South Indian Ocean. As the ocean is warming, the region which experiences temperatures conducive to tropical cyclone formation is expanding and temperatures in the tropical regions are becoming warm enough for cyclone intensification. Category 5 tropical cyclones, which have been experienced in the North Atlantic for almost a century, started to occur in the South Indian Ocean since 1994, and have occurred increasingly frequently since then. Tropical cyclones are classified on the basis of their wind speed and central pressure. The weakest storms to be classified as tropical cyclones - category 1 - have a minimum sustained wind speed of 119km/hr. At category 3 the storms have a minimum wind speed of 178 km/h. As the category increases, so too does the potential for damage. Category 1 storms are classified as resulting in dangerous winds that cause some damage, whereas category 3 storms are expected to cause devastating damage.